If you’re running a high-performance system, or a mid-grade system at max capacity, you may have noticed that the temperature output of your PC is considerably higher than that of more basic systems. While this is completely normal, it also requires a bit more monitoring and tinkering to maintain safely than a more basic, simple system. Fortunately, the solution is affordable, simple, and easy to take care of on your own; you just need to find the best thermal paste for your PC setup. Modern PCs require the use of a thermal paste of one sort or another, plain and simple. This isn’t a matter of opinion like it was 15-20 years ago; at which time you really could get by with just a fan system to keep your CPU, GPU, etc. at an acceptable temperature level. Why Do Modern High-Performance Systems Produce More Heat? Heat is an unavoidable byproduct of electronic operations; particularly in complex electronics such as an advanced PC. As technology advances, the use of more and more complex internal PC parts has been necessary to efficiently run our increasingly complicated tech. Modern CPUs, GPUs, HDD, and ODD require more electrical current to perform their tasks. As the electrical input runs along wires, circuits, etc. it meets a certain level of resistance. This friction is how the byproduct of heat is produced. You can avoid overheating by using a combination of an efficient CPU cooler, case fans, and the best thermal compound. Under What Circumstances Do You Need a Thermal Paste? When you buy a new computer, the heat sink and CPU already have the appropriate layer of thermal paste; or compound; laid between the surfaces. Unless you’re buying a unique chassis setup that doesn’t come with the parts that you’re likely to want to handpick individually, you won’t have to worry about thermal paste when you first set up. The chances are good that if you’re reading this guide, you’re doing some modifications to your PC or you’re having overheating problems. Whether you’re tackling a simple task like switching out your CPU or gutting your case and starting fresh, now is the right time to bust out the thermal paste. Even if there’s thermal paste already in place that seems perfectly reusable; don’t. Clean the surfaces that are already tacked completely and then reapply the best thermal paste for your PC project needs. This guide will walk you through the entire process of removing and applying thermal compounds since it’s very important that you do it right. This will take care of any existing overheating problems that were related to the thermal paste as well. If you continue to have overheating problems after replacing your thermal compound you should clean your fans, case, etc. and continue to troubleshoot from there. Which Thermal Paste is Right for You & Your PC? Choosing the best thermal paste for GPU, CPU, or general PC maintenance can be a bit tricky. Largely because opinion varies so widely on which ones are best, which ones are rubbish, or whether there is any difference at all between different types of paste. The main division of opinion is based around whether or not using filler compounds that are simultaneously conductive and capacitive (such as silver) is preferable to using lower thermally conductive fillers (such as zinc oxide). The main concern here is that materials like silver can cause A LOT of damage if it comes into contact with your circuits. The ingredients found in different thermal compounds can include a combination of the ‘Filler Properties’ found here. Despite the concerns surrounding most silver fillers, you can ask almost any techie if they’d recommend Arctic Silver 5 as a thermal paste, and they wouldd say yes. This thermal compound is 99.9% micronized silver; which is not conductive like most silver compounds. It is guaranteed not to “run, bleed, or migrate” as well, which keeps your circuits extra safe while taking advantage of the high thermal conduction of the filler. The ARCTIC MX-4 is another favorite amongst gamers, overclockers, and other PC enthusiasts. This is a really great choice if you’re avoiding metal and looking for a high quality thermal paste that won’t need frequent replacement. In spite of its lack of electrically conductive metal filler, it is highly thermally conductive. ARCTIC MX-4 is composed of carbon microparticles, which actually outlasts pastes with metal or silicon fillers. This durability is a huge selling point for PC users who frequently move their computer around or open up their case. Noctua is notorious for making quality products, from their fans to their CPU cooling systems. Their thermal paste is no exception. They use a unique combination of different micro particles in their filler in order to provide some of the best heat sinking possible. Noctua NT-H1 is yet another thermal paste that withstands the tests of time and use. It is estimated to be at max effectiveness for cooling your PC for up to 3 years. This is another thermal compound that’s a bit of a mystery. It has great ratings overall, and works very effectively. However, they won’t disclose the exact ingredients of their filler. The filler does include Diamond powder; which is considered a high quality conductor. It has low phonon scatter and high covalent bonding. For more information on the specifics of diamond conductivity, we suggest you check out this relatively interesting article, “Is Diamond a Conductor?“. Thermaltake really outdid themselves with the TG-7 Extreme Performance. The diamond powder filler included in the compound provides dramatically improved thermal conductivity in comparison to their other products. 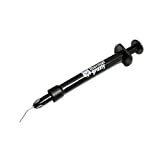 TG-7 Extreme Performance is a long-lasting solution that will provide maximum contact and minimal air gaps. Your PC only stands to gain from using this quality thermal paste. Wigbow Ice Mountain No1 is definitely one of the best thermal compounds available on a budget. It is a high performance compound which is perfect for use on your CPU, GPU, and other heat sensitive parts that require a heatsink. The base of this product is a polysynthetic carbon, which is highly effective for heat sinking and transference. It is particularly easy to apply in syringe form. This thermal paste is considered to have one of the best thermal conductivity for CPUs and GPUs with high-performance level. MasterGel Maker Nano comes with non-curing and non-electrical conductive features due to which there won’t be any short-circuiting. It’s a great option for those who need durable protection for high-grade performance. 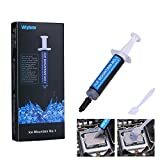 Thanks to the NanoDiamond particles and good viscosity this thermal paste is rather light and easy both to spread and remove without drying out. Besides, it can survive a great range of temperatures from -50 up to 150°С. It’s a high-quality thermal paste which will make you forget about such unpleasant things as auto-oxidation or erosion over time. With thermal conductivity of 8.5W/mK, Gelid Solutions GC-Extreme isn’t a bad route to go if you need to replace your existing heatsinks or installing some new gear, such as a CPU cooler. It is easy to use and even comes with an applicator tool. Gelid Solutions GC-Extreme is a specialized, non-curing compound which makes it more effective for longer periods of time, but also makes it riskier to move your computer around frequently. It’s also easy to clean up. Prolimatech Pk-3 Nano boasts very low thermal impedance, but retains thermal conductivity of 11.2W/m- Celsius as well. They’re also one of the longest lasting thermal compounds around. Because it does not ‘set’ or harden it doesn’t crack as it ages. This makes a huge difference in long-term use. The Coollaboratory Liquid Ultra Thermal Paste was designed for optimized performance and ease of application. Wetter than normal thermal pastes, the Coollaboratory Liquid Ultra Thermal Paste provides a slick and precise application experience. Made 100% from metal it boasts a 38.4 W/mk capacity and helps to radically drop temperatures. Although, the product has been known to produce metal balls during application that need to be cleared before use, and is incompatible with aluminum coolers. 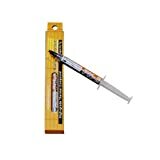 The Thermal Grizzly Kryonaut Thermal Grease Paste is an application dream with the included spreader tool and compound product. Not electrically conductive, the thermal conductivity hovers around 12.5W/mK, which allows this product to go head to head with many of the best thermal pastes on the market despite being relatively new to the competition. 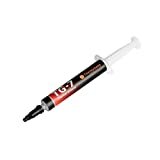 Thermal Grizzly Kryonaut Thermal Grease Paste is more expensive than most by up to double for half the amount of product, however, with the increased performance and staying power, this paste is worth it. 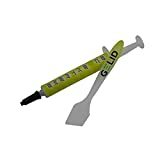 Similar to the Coollaboratory Liquid Ultra Thermal Paste, the Coollaboratory Liquid Pro is a 100% metal thermal paste in a syringe-style applicator. However, unlike the Liquid Ultra, the Pro mixture offers a capacity of 82W/mK. This paste reduces the amount you would use compared to other thermal pastes, which ultimately saves you money. Although, it is worth noting that this thermal paste is electrically conductive, which if not handled properly, can be dangerous. As spreading thermal compounds is a kind of delicate work, it’s really important to get a thermal paste that is easy to apply, and Thermal Grizzly Conductonaut is a good example. 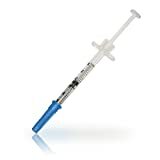 Its 1.0 syringe is convenient to use for spreading the paste – just squeeze a small drop onto the included swab and spread it. Still, be careful not to drop it onto the graphics card as you will brick it. 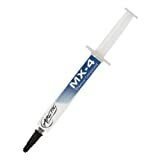 By the by, this thermal paste comes with a changeable applicator nozzle on the tube. Thermal Grizzly Conductonaut has 73 W/mk of thermal conductivity. It’s one of the best products to reduce the temperature of your PC down (up to more than 20°C) and to let it show its best performance.